Aberdaron VillageAberdaron is a former fishing village at the western tip of the Llyn Peninsula with cafes, restaurants and a sailing club. The village hosts an annual sailing regatta and coastal heritage is celebrated with the popular Llyn Coastal Festival. It has a mile long sandy bay and lies within an Area of Outstanding Natural Beauty (AONB). There is plenty to explore including sea caves and rock pools, the coast path leads to small beaches in both directions. Windsurfing, kayaking and sailing are popular activities as are boat trips, including summertime trips to Bardsey Island from nearby Porth Meudwy. A haven for wildlife, Bardsey Island is a National Nature Reserve and a Site of Special Scientific Interest (SSSI). 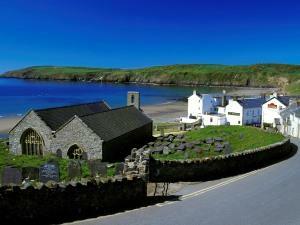 Aberdaron is a former fishing village at the western tip of the Llyn Peninsula with cafes, restaurants and a sailing club. The village hosts an annual sailing regatta and coastal heritage is celebrated with the popular Llyn Coastal Festival. It has a mile long sandy bay and lies within an Area of Outstanding Natural Beauty (AONB). Nearby, the National Trust owned Plas yn Rhiw country house dates from the early 17th century; the house and gardens offer stunning views across Cardigan Bay. A499 from Pwllheli to Llanbedrog; right onto B4413 to Aberdaron.